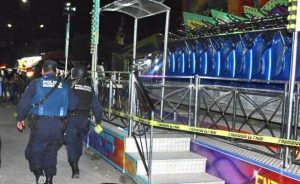 Police tape off ride as investigation into incident gets underway. This entry was posted in 2018, Accidents, July and tagged Accident, Fair, Mexico, Pacueco, Sartori, Twister, Virgin of Santa Ana. Bookmark the permalink.